Austin-based video and web collaboration analytics provider makes room for up to 50 percent more staff in new office space. AUSTIN, TX (May 13, 2015) — Vyopta Incorporated, the industry leader in video and web collaboration analytics, announced today that it has moved its company headquarters to Barton Creek Plaza Office Building near Austin’s technology corridor and walking distance from the Barton Creek Greenbelt. Located at 3755 South Capital of Texas Highway, Austin, Texas, 78704, and occupying just over 6,100 square feet, Vyopta’s new office space provides the company with an the opportunity to grow its staff by 50 percent or more after experiencing a significant uptick in customers and sales in 2014. Vyopta provides powerful analytics products that help large enterprises improve video and web collaboration. Since being founded in 2007, Vyopta has grown with the video collaboration industry and transformed from a services-based company to a products-based company, now offering cloud-based solutions that allow organizations to simplify the management, reduce the cost and improve the quality of video and web collaboration. Its cloud-based platform allows Vyopta to improve its products continuously and be more responsive to customer feedback. “Vyopta is committed to creating intuitive yet powerful products that our customers love to use,” said Rick Leung, Vyopta’s chief technology officer. “Our products helped our customers increase video collaboration by 40 percent on average last year, with several customers exceeding 30 million minutes of video conferencing per year.” Today, the company is proud to serve some of the most demanding enterprises in the world, including five of the Fortune 50; several of the largest telehealth deployments in the world, including the Department of Veterans Affairs; a wide range of global technology firms; and many of the country’s leading financial institutions. Vyopta’s new headquarters occupy approximately 1,000 more square feet than its previous office, providing an opportunity for the company to grow staff by up to 50 percent. Its hybrid environment consists of traditional offices, conference rooms with the latest in telepresence equipment, open-collaboration spaces and views of the Barton Creek Greenbelt. One of the most unique elements of Vyopta’s new headquarters is the prevalence of video conferencing equipment in every meeting room and collaboration area and from all employees desktops. The company uses video as its preferred method of communication to collaborate with Vyopta team members, customers and partners. Additionally, Vyopta leverages video-collaboration technology to maintain the richness of in-person interviews when recruiting new team members. “It’s important that our new work space and the unique elements we decided to incorporate into it, convey our daily commitment to our customers,” said Andrew Chen, Vyopta’s vice president and general counsel. “We believe our customers go above their call of duty, acting as IT superheroes to ensure their organizations use video effectively to collaborate and make an impact.” Vyopta’s new company headquarters were designed to create an environment where employees can do their best work, make an impact and grow. Over the next year, Vyopta will be growing its software development, sales and marketing, and customer success teams. Available positions can be found online at https://www.vyopta.com/about-careers. Vyopta provides the most powerful analytics products that large enterprises use to improve video and web collaboration. 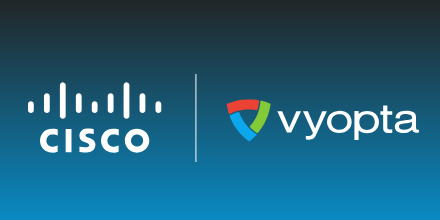 Our cloud-based platform allows organizations to simplify the management, reduce the cost and improve the quality of video and web collaboration by monitoring, integrating and analyzing data from virtually all enterprise collaboration technology providers – including Cisco, Polycom, Microsoft, Vidyo, Lifesize, Acano, Pexip, and vBrick. Vyopta products are used by many of the largest private and public sector enterprises in the world – including eBay, Cimpress/VistaPrint and the U.S. Department of Veteran Affairs – across a wide range of industries including finance, technology, healthcare, consumer products, higher education and government. Vyopta is a rapidly growing company headquartered in Austin, Texas.